I was so excited when Christina invited me to guest post on her blog! Christina is such a cooking and foodie inspiration to me. Not only is she a spunky, hilarious, and introspective friend, but she is also incredibly talented, independent, passionate about food in a way I’ve only read about, and a total self-starter. She has this innate ability to whip up the most gourmet looking, soul-enriching, satiating, healthy, and natural food and make it look so easy. When Christina asked me to test out one of her recipes and recap the experience, I immediately knew which one I wanted to make – the apricot chickpea salad. Christina brought this delectable dish to my New Year’s party this past January and it was a total hit. One of my extremely particular, amazing cook, foodie friends (who tracks all her recipes on her blog – Hungry Pug) contacted me the next day requesting Christina’s recipe and is still raving about it. Thus, my recipe testing began. I should preface this by saying I just recently (in the past five years) starting cooking (unless you consider microwaving cooking) and would define myself as somewhat a novice in regards to my skills in the kitchen. In other words, if I can do it, you can most definitely do it. About a year ago my boyfriend and I picked up some dried garbanzo beans at the Capitol Hill Farmer’s Market from Alvarez Farms with all the best intentions to use them for making hummus (yum!). Fast forward a year and they are still sitting in our cupboard…well were until this cooking opportunity presented itself. So I soaked the beans overnight (I doubled the recipe quantities, as Christina recommends, given how delicious I recalled this salad being and how well the taste improves over the span of a few days). After soaking the beans I cooked them for a few hours and began preparing all the ingredients as Christina’s recipe instructs. 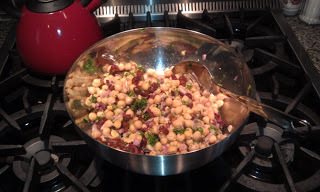 Once the beans were done and drained, I added the dry ingredients and then tossed everything in the vinaigrette and headed to the gym (the pic here is what the mixture looked like right before I threw it in the fridge). About an hour later I received a text from my boyfriend that said “Holy (insert expletive here), this salad is amazing!” – and he is not prone to hyperbole. I rushed home from the gym, excited to taste the outcome, and was not disappointed. All the elements of the salad balance each other so delicately and the salad definitely improves with time (I just had it for dinner tonight – day 2 of marination and it was incredible). I am also happy to report that my boyfriend and I are converted to dry beans. The freshly cooked beans were plumper and meatier and nuttier than the canned variety and only required a bit of foresight and time in terms of prep – totally worth it!